Kafka, whose name has generated an adjective, is one of the best loved writers of the twentieth century. Known for his dark, enigmatic stories, for the absurd nightmares he depicts, his extraordinary imaginative depth is clear in stories from 'A Hunger Artist' to 'The Verdict'. 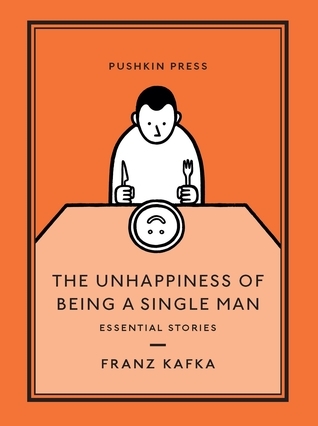 But Kafka also wrote fizzingly funny, fresh stories, and The Unhappiness of Being a Single Man contains all the aspects of this genius: the wit and the grit; the horror and the humour; the longing and the laughing. They range from bizarre, two-sentence stories about Don Quixote to the famous brutal depiction of violence and justice that is 'In the Penal Colony'. In a nimble new translation by the acclaimed Alexander Starritt, this collection of Kafka's essential stories shows the genius at his very best. Having read all Kafka's longer, better-known works, I was excited to have the opportunity to sample some of his short stories. This is an eclectic collection that ranges from stories spanning several pages to brief vignettes lasting only a few sentences. I found them all wonderful, though some of my favourites included 'In the Penal Colony', 'The Stoker', 'The Unhappiness of Being a Single Man', and 'The Verdict'. If you are a fan of Kafka's writing, you're certain to find something to enjoy in this collection. If you are new to Kafka, this volume would provide an excellent introduction to his style before you pick up one of the novels. All in all, a delightful read.